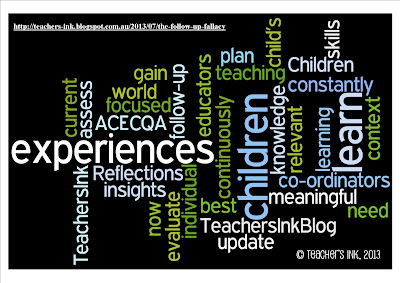 In Quality Area 1: “Children learn best when the experiences they have are meaningful to them and are focused on the here and now. 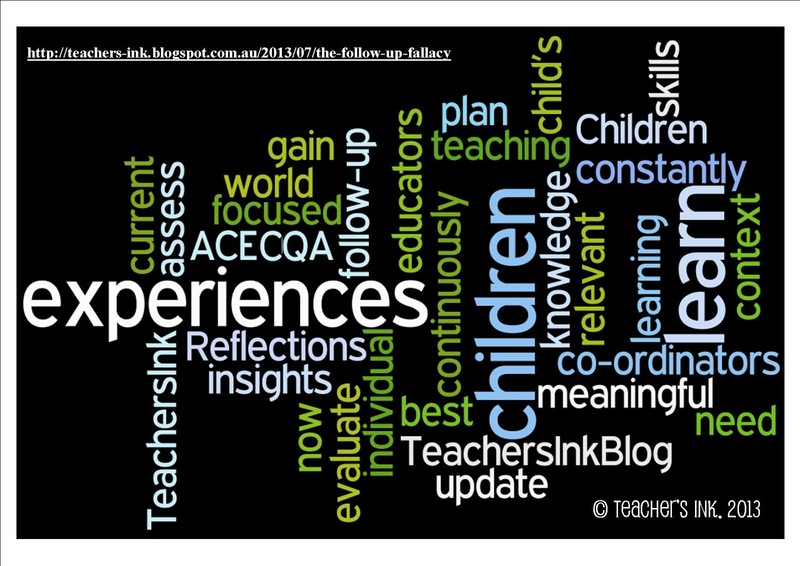 Because children constantly learn new skills and gain new insights into their world, educators and co-ordinators need to continuously assess and evaluate teaching and learning to update their knowledge of individual children and to plan new and follow-up experiences that are relevant to the child’s current context.” (ACECQA, 2012 p 23). So, ask yourself if follow-ups as we understand them, were a core component of the programming and planning process, then the term “follow-up” would have been embedded in the terminology of the NQS right? Like a lot? “Children learn best when the experiences they have are meaningful to them and are focused on the here and now.” ... so where does the mentality of “follow-ups” a week later, or two, or sometimes three come into the “here and now”? I believe that it is important to support children. But that support doesn't necessarily need to be in the form of an activity. But this is what many of us do, or are told we have to do! I'm not saying that activities are bad ... but they aren't everything, and they aren't the only avenue of support and teaching! They certainly aren't the only vehicle for learning, being, or knowing! If children are constantly changing and evolving in their skills and knowings, then how do we support them by doing something (and sometimes long) after that moment has passed? So, what if we use ourselves, our teaching skills? (And I don’t mean over take or instruct, but I’m sure I’ll post on this later at some point). What if we are subtle in our approach? What if we take away the activity focus. What if we support in the here and now when it is most relevent to the child/ren? Kindy Staff Too Busy Reporting To Care?